NEW YORK, NY—Grammy Award-nominated pipa player Wu Man, named Musical America’s Instrumentalist of the Year in 2013, joins the foremost ambassadors of music and instrumental traditions from across the world to perform in two major anniversary celebrations, one for Music From Japan and the other with Yo-Yo Ma’s Silk Road Ensemble. On Saturday, February 7 at 8 p.m. at the Asia Society, Unkai (Sea of Clouds), a new work by New York-based composer Ned Rothenberg, commissioned by Music From Japan for its 40th anniversary, receives its world premiere with Wu Man on Chinese pipa, Mayumi Miyata on sho (mouth-blown free reed organ used in gagaku, or imperial Japanese court music), and Jin Hi Kim on komungo (fourth-century Korean fretted zither). Mr. Rothenberg, a multi-instrumentalist who plays and has written works for shakuhachi (Japanese end-blown bamboo flute), composed Unkai specifically for the talents of the three performers. The program also includes a group improvisation and series of traditional and contemporary solo repertoire for the three East Asian instruments, with Wu Man performing Xi Yang Xiao Gu (Flute and Drum Music at Sunset) and two self-written works, Night Thoughts and Leaves Flying in Autumn. As Wu Man’s first collaboration with Ms. Miyata and Ms. Kim, this concert marks the special occasion of three internationally acclaimed traditional instrumentalists from China, Japan, and Korea coming together to showcase their individual instruments and the music from their respective cultures. Wu Man says, “I am thrilled to be working for the first time with Mayumi Miyata and Jin Hi Kim, two female Asian musicians who are both well-established, highly respected, and incredibly creative artists. As we share similar but disparate cultural backgrounds, this experience of representing our three countries is very meaningful to me and us as a trio, and I look forward to premiering Unkai, a poetic, beautifully colored work. For information on purchasing tickets priced at $40 for non-members, visit asiasociety.org or call the Asia Society box office at (212) 517-2742 between 1 and 5 p.m. ET, Monday through Friday. For details on the Music From Japan 40th Anniversary Festival, visit musicfromjapan.org. On Thursday through Saturday, February 19 at 7:30 p.m. and February 20 and 21 at 8 p.m. at Avery Fisher Hall, Wu Man performs with the Silk Road Ensemble, of which she is a principal and founding member, in its New York Philharmonic debut and 15th anniversary season. The program opens with fellow Ensemble members Cristina Pato and Wu Tong’s Fanfare for Gaita, Suona, and Brass, followed by The Silk Road Suite, which includes Wu Man’s work Night Thoughts. Alan Gilbert conducts members of the Silk Road Ensemble in performing selections from Dmitri Yanov-Yanovsky’s Sacred Signs Suite, a concerto for 13 musicians, receiving its New York premiere, including the “In the Dance” movement in which Wu Man is featured alongside tabla player Sandeep Das. The New York Philharmonic joins Wu Man and the rest of the Silk Road Ensemble to play Osvaldo Golijov’s Rose of the Winds after performing R. Strauss’s Death and Transfiguration. “The Silk Road Ensemble concerts with the New York Philharmonic, which fittingly coincide with the Chinese New Year, will be a special way to celebrate my 15 years in Yo-Yo Ma’s group, and I’m excited for the opportunity to showcase the pipa in Night Thoughts at these concerts as well as in the Music From Japan program,” continues Wu Man. Tickets starting at $50 are available online at nyphil.org, by phone at (212) 875-5656, or in-person at the Avery Fisher Hall box office. Wu Man has recorded three albums with Silk Road Ensemble: Silk Road Journeys (Sony, 2002), Silk Road Journeys: Beyond the Horizon (Sony, 2005), and the Grammy-nominated Off the Map (World Village, 2009), as well as the CD/DVD A Playlist Without Borders/Live from Tanglewood (Sony, 2013). 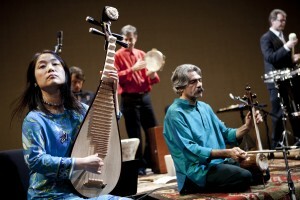 She is also featured as part of the Silk Road Ensemble on the Chicago Symphony Orchestra’s Grammy-nominated album Traditions and Transformations: Sounds of Silk Road Chicago, performing Lou Harrison’s Pipa Concerto. Wu Man made her New York Philharmonic debut in 2003 performing the world premiere of Bright Sheng’s The Song and Dance of Tears with Mr. Ma, Mr. Tong, and pianist Emanuel Ax. In 1999, Wu Man performed with Mr. Ma at the White House to premiere Mr. Sheng’s Three Songs for Pipa and Violoncello. That same year, Mr. Ma was awarded the Glenn Gould Prize and selected Wu Man as the Glenn Gould Protégé. Following the performance at the Asia Society, Wu Man tours the Music From Japan program with Ms. Miyata and Ms. Kim to Washington, DC’s Freer Gallery of Art on Tuesday, February 10 at 7:30 p.m., the Fukishima City Concert Hall on Friday, March 6 at 6:30 p.m., and Tokyo’s Bunka Kaikan Recital Hall on Sunday, March 8 at 2:30 p.m. 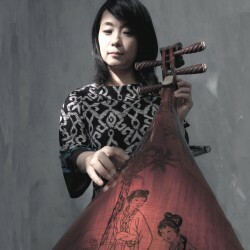 Recognized as the world’s premier pipa virtuoso and leading ambassador of music from China, Wu Man has carved out a career as a soloist, educator, and composer, giving her lute-like instrument—which has a history of over 2,000 years in China—a new role in both traditional and contemporary music. Through numerous concert tours, Wu Man has premiered hundreds of new works for the pipa, while spearheading multimedia projects to both preserve and create awareness of China’s ancient musical traditions. Her adventurous spirit and virtuosity have led to collaborations across artistic disciplines, allowing Wu Man to reach wider audiences as she works to break through cultural and musical borders. When Wu Man was named Musical America’s Instrumentalist of the Year in 2013, it was the first time the prestigious award had been bestowed on a player of a non-Western instrument. Orchestral highlights of Wu Man’s 2014-15 season include performances of Lou Harrison’s Pipa Concerto with The Knights and Zhao Jiping’s Pipa Concerto No. 2 with the Canton Symphony Orchestra, Charlotte Symphony Orchestra, Orchestre Philharmonique du Luxembourg, and Orlando Philharmonic Orchestra. In recital, Wu Man takes her new program, “Journey of Chinese Pipa,” to London, Sydney, and Dortmund, exploring the history of solo pipa repertoire, ranging from traditional folksongs to original compositions by Wu Man herself. A frequent collaborator with Kronos Quartet for over 20 years, she rejoined them at Cal Performances in January and plays with the ensemble again at the SFJAZZ Center in June in Terry Riley’s The Cusp of Magic, which was composed on the occasion of the composer’s 70th birthday. These performances celebrate the work’s 10th anniversary as well as the composer’s 80th birthday. Born in Hangzhou, China, Wu Man studied with Lin Shicheng, Kuang Yuzhong, Chen Zemin, and Liu Dehai at the Central Conservatory of Music in Beijing, where she became the first recipient of a master's degree in pipa. Accepted into the conservatory at age 13, Wu Man’s audition was covered by national newspapers and she was hailed as a child prodigy, becoming a nationally recognized role model for young pipa players. In 1985 she made her first visit to the United States as a member of the China Youth Arts Troupe. Wu Man moved to the US in 1990 and currently resides with her husband and son in California. For more information on Wu Man, please visit www.wumanpipa.org or follow her at facebook.com/wumanpipa and twitter.com/wumanpipa. Saturday, February 7 at 8 p.m.
Thursday, February 19 at 7:30 p.m.
Friday, February 20 at 8:00 p.m.
Saturday, February 21 at 8:00 p.m.